Scenes from my wedding this past June ~ bridesmaids bouquet’s & matching garment bags, tres chic! It was so lovely to partner with Snippet & Ink for their upcoming May giveaway geared towards bridesmaids. Since planning my wedding, fresh on my mind is all things something blue with touches of gold that inspired the new bridal collection Flappers & Philosophers. 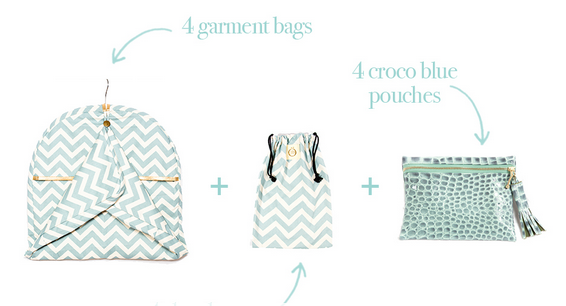 Ever so classic is the Chevron blue hue carrier for your treasured threads!